The Eagles will have seven running backs on the roster when training camp kicks off on July 26. Either four or five of these will make the 53-man roster, and based on recent history if a running back is active on gameday he will likely see touches. That's because Duce Staley runs his running backs group by committee. In the Eagles' Super Bowl campaign last season, six running backs got at least 10 carries and four eclipsed the 100 yard mark. Last year's leading rusher LeGarrette Blount left in free agency, taking with him a team leading 173 carries. It seems like a no-brainer that Jay Ajayi will step up and replace his production, right? Staley seems very high on Ajayi and his potential to be a de facto featured back for the Birds. But perhaps not. "I am pretty sure Jay is excited about going out there and being able to dominate and be that guy," Stayley said back in June. "I know Doug [Pederson] is excited about it also so I guess we will see." "If you look and study us for the last couple of years, a lot of [the carries distribution] comes from being that guy. When we have a group of backs we are going to start off with a back and he's going to run until his tongue is hanging out and then here comes the next guy. A lot of you see that as a running back by committee and I would agree with that." In other words, Staley plans to throw Ajayi into the fire as the No. 1 guy, and once he slows down he'll lean on Clement, or even Sproles. Last season, Blount led the Eagles in rushing attempts 10 times, Jay Ajayi six times, Wendell Smallwood once, Corey Clement once and Sproles once (including the playoffs and Super Bowl). As the season wore on there was more variance in who led in carries. According to the Eagles' newly promoted assistant head coach, this was by design. "It's a big asset simply because once these guys get that experience," Staley said of the committee approach. "Say one goes down, it's part of the league. You can plug a guy in and you're not trying to change the offense because you know the guy you are plugging in. 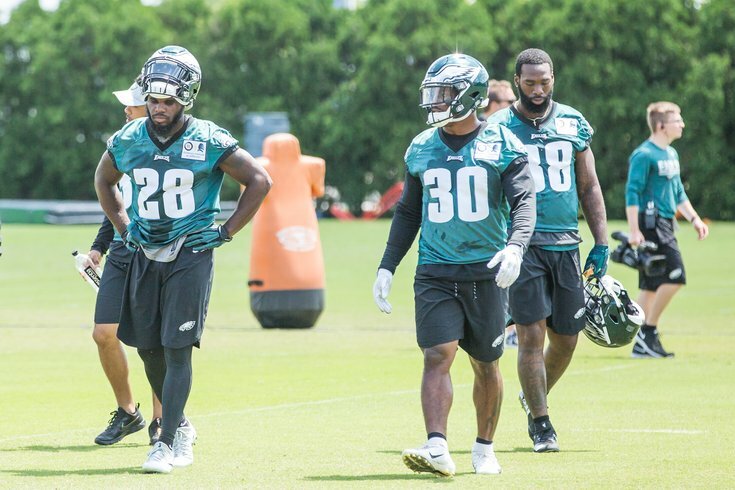 "With our situation last year, you look at LeGarrette, you look at Corey, you look at Jay, we sprinkled in Kenjon [Barner] a little bit too, and defensively it's frustrating because they can't pinpoint one thing with one guy and Doug takes pride in that. I take pride in that." 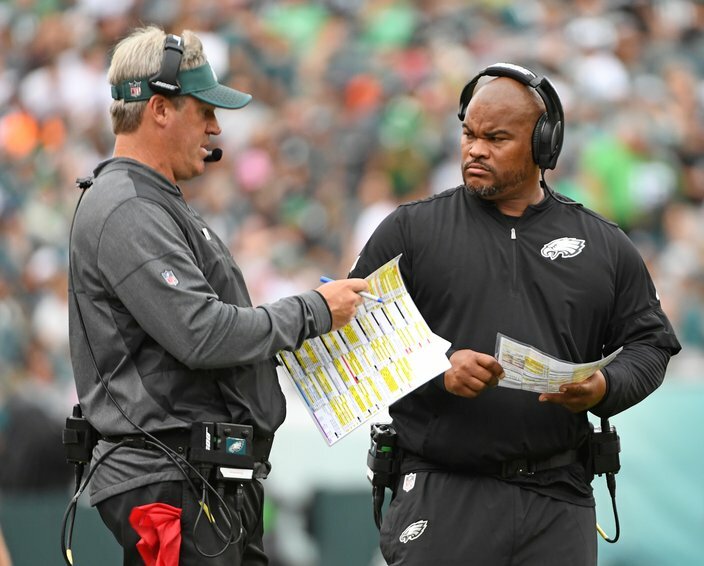 Doug Pederson promoted Duce Staley to assistant head coach. How much of the Eagles' running backs rotation is planned and how much is spontaneously dictated by the game? It's a pretty even mix, Staley suggests. "A lot of that is gut. A lot of it is a feeling," he said. "If you get a guy who is hot, it's almost like a pitcher in baseball. If he gets hot you want to keep him going. You want to keep that juice going. It's about getting the right guy on the field and keep that juice going and rotate someone in who is going to continue to keep that juice flowing." Having a consistent and reliable running game may be a little more important when the Eagles begin the 2018 campaign, with Carson Wentz seeming more and more likely to return from his torn ACL injury last fall. All indications are that Wentz will not play in the preseason, and if he does start in Week 1 against the Falcons, giving him relief through the run game could play a big part in helping him feel comfortable under center again. In order for the committee approach to work in an NFL full of egos, short careers and intense competition, the Eagles' team-first locker room culture has been key. "Telling them it's not about them, it's about us," Staley said of his running back room, "that's the most important thing for them to understand. You have that conversation with them as soon as they walk in the door. You don't hold it back. It's about the team. It's always about the team. You're either with us or against us. You tell them that and you see Sproles, you see Jay, say 'if that guy can do it I can too'. Once you share that with them they cant help but try and catch on. "If not, you will get left behind and I will not tolerate that in my room."